I recently received a mini cheesecake pan and could hardly wait to try it out. This pan is much like a mini muffin pan, but with removable bottoms. The pan has a hole in the bottom of each compartment, and a small disc is used to cover the hole. When the cheesecakes are done, you can use the handle of a wooden spoon or your finger to push the cheesecakes up and out of the pan. I read through many a recipe and averaged one to use for my maiden mini cheesecake voyage. I started with a graham cracker crust and filled that with a straightforward cheesecake filling. This is a very simple recipe with just a handful of ingredients. I thought the individual size of the cheesecakes was just begging for various toppings. First up was a topping similar to Quinn’s praline whipped cream that topped my birthday cheesecake. Basically, it’s the same recipe but with Creme de Cacao instead of Praline. This on top of a cheesecake with some chocolate grated over and around it, and you’ve got yourself a pretty little dessert. The other topping I whipped up was a Raspberry-White Chocolate glaze. This is incredibly simple to make. All you need is white chocolate and raspberry preserves. The glaze is a bit thick. Don’t think you can drizzle it. A little dollop on top of one of these cheesecakes is just perfect, though. I had bigger ambitions for other toppings, but I ran out of time for experimenting. I really wanted a chocolate caramel mixture to drizzle on top. And maybe something involving nuts. There’s always next time! Visit the Recipe Index for more cheesecake recipes. 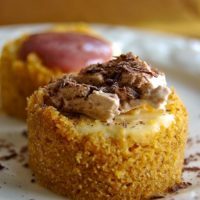 Mini Cheesecakes are bite-size versions of everyone’s favorite dessert. Use your favorite topping or a variety of toppings for a fun and beautiful dessert! Preheat oven to 350°F. Generously grease a 12-cup mini cheesecake pan or mini muffin pan. You may also place liners in mini muffin pan. Mix the graham cracker crumbs, sugar, and butter until combined. Press the crust into the bottom and about halfway up the sides of the prepared pan. Using an electric mixer on medium-low speed, beat the cream cheese, sugar, egg, and vanilla until well-blended and smooth. Pour the batter over the crusts. Bake 12-14 minutes or until set. Place the cream, cream de cacao, cocoa, and sugar in a large bowl. Beat until soft peaks form. Dollop or spread on chilled cheesecakes before serving. Place the white chocolate in a microwave-safe bowl. Microwave at half power in 30-second increments until the chocolate melts when stirred. Add the preserves and stir until blended.